You’ve never felt full abdominal range of motion like this. The new Leverage Ab Bench from Body-Solid delivers six-pack abs and well-developed obliques like no other machine! The specially designed curved back pad puts you into a deep pre-stretch position for exercise motion that ranges from 30° back of center to 30° front of center. The heavy-gauge 2” x 3” steel mainframe feature all-4-side welded construction for a rock-solid foundation. Extra-thick and durable DuraFirmTM back and seat pads deliver comfort and proper posture. Crunch your way to a flat stomach the smart way! The chrome weight carriage accepts Olympic plates for minimal to maximum resistance. Extra-wide, sealed ball bearing pulley allows complete freedom of movement for oblique workouts as well. Infinitely adjustable back pad ensures quick and easy adjustment for all size users. Excellent for triceps extensions, too. Features full range abdominal resistance. Full range motion starts at 30 degrees back of center to 30 degrees forward of center for a full range of exercise motion. Curved back pad puts you in a pre-stretch position that allows more intense abdominal contraction. You will get twice the results in half the time with a lot less work. Extra-wide, sealed ball bearing pulley allows complete freedom of movement for oblique workouts as well. Infinitely adjustable back pad ensures quick and easy adjustment for all size users. Excellent for tricep extensions too. 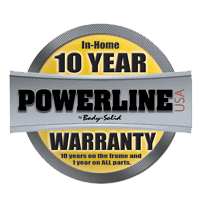 This Limited Express Warranty applies only in the United States to products manufactured or distributed by Body-Solid, Inc. ("Body-Solid") under the POWERLINE by Body-Solid brand name (hereinafter referred to as “Product”).